Gallup Is Right: The Unemployment Rate Is A Big Lie - Wall St. for Main St.Wall St. for Main St.
On Friday Feb. 6th the Bureau of Labor Statistics (BLS) reported an unemployment rate of 5.6 percent. This sounds great on the surface, but Gallops CEO said it best; the unemployment rate is a big lie. According to Gallop CEO Jim Clifton, if one hasn’t been working for four weeks or actively looking for work, they aren’t counted as unemployed. Also, if you work one hour a week, or get paid at least $20.00 a week, you aren’t counted as unemployed. This explains why 30 million Americans are out of work or severely unemployed. What also helps explain the low unemployment rate is that nearly 22 million Americans are under employed. This means is, that if you are working part time because you’re unable to find full time work, you’re still counted as employed. Or if you have a PHD or Masters, but work as a cashier, you are considered employed. The BLS also counts part time and temporary work as jobs created. Currently, 44% of Americans work 30 hours or more a week. Most people in Human Resources (HR) consider a full time job 40 hours or more. If a company hires 2 temporary workers, and lays off a full time worker, the BLS counts that as one job created. As an example of this, in the June 2014 jobs report, 523,000 full time jobs were lost, but 799,000 part time jobs were created. This netted a gain of over 300,000 jobs. In fact since the “recovery” began, most of the jobs created were part time. In 2013, 75% of the total jobs created were part time jobs. This is why two-thirds of Americans are now living pay check to paycheck. These doctored up numbers aren’t the only reason the unemployment rate has declined. 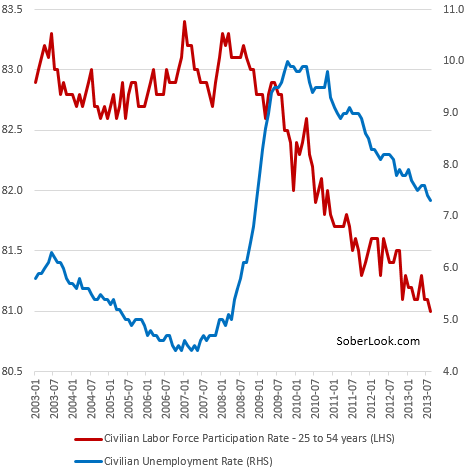 Look at this labor participation rate chart from the BLS. When looking at the chart, one can see the decline in the unemployment rate correlates with the decline in the labor participation rate. On Feb. 6 when the BLS announced the job data, it claimed that only 1900 jobs were lost in the energy patch. Meanwhile, Gary Christmas said that 21,322 jobs were lost. Why didn’t the BLS count those jobs? As you can see, the unemployment rate is just masking the true dire state of the US economy.